Good news from Greyhawk Reborn! One of my wishes has come true, there will be Greyhawk to play at Gen Con 2015. Here is their promo letter and a link to a questionnaire to help them plan for this convention appearance. Check it out! "Are you a Greyhawk fan? Would you like to walk the Flanaess once more? Would you like to be part of tales on Oerth again? From the ashes, Greyhawk is reborn! As the longest running 5th Edition Dungeons & Dragons living campaign, Greyhawk Reborn began two years ago, starting in 613 CY, 15 years after the end of Living Greyhawk, using the D&D Next Playtest. The year is now 615 CY and Greyhawk needs heroes once again at Gen Con 2015! Once more explore one of the oldest, most beloved campaign worlds of all time. The world of Greyhawk will come alive again as your characters, your HEROES, wander upon the Flanaess, pushing back the darkness. Venture forth anew in the realm that brought you classics such as The Village of Hommlet, White Plume Mountain, Against the Giants, Slavers, and the Living Greyhawk campaign. Revisit places such as Saltmarsh, Greyhawk City, the Vast Swamp and the Amedio Jungle. Create new player characters in your favorite world with classic races and classes. Create mighty warriors, powerful wizards, saintly clerics and dubious rogues. Your characters’ actions will continue to shape the world of Oerth. More commonly known in the Mid-Atlantic region, Greyhawk Reborn has active players in Pennsylvania, Maryland, Connecticut, Virginia, New York and New Jersey. In addition, we also have a group running their first convention in Los Angeles, California." CLICK THIS LINK to complete a brief questionnaire that will provide the GHR Staff feedback to ensure we schedule just the right amount of tables to satisfy the Greyhawk Reborn interest and curiosity. We would hate to request three tables and find that we are turning people away at “The Best Four Days in Gaming”! When you’ve finished, please forward the link to your friends! Learn more about us on our website at www.GreyhawkReborn.com find us on Facebook! Greyhawk Reborn is not sponsored, associated or affiliated with, or endorsed by Wizards of the Coast or Gen Con, LLC in any way. "On February 15, 2015, Wizards of the Coast will terminate our LISTSERV system that manages this (and other) mailing lists. We've watched the usage of these mailing lists dwindle due to the rise of other communication platforms, such as forums and social media. Given this decreased usage, we have made the decision that it was time to turn them off." Back in the day these mailing lists were a valuable forum for discussion of many fan-favorite game worlds including Mystara and Greyhawk. For those folks who like to collect and save every bit of online lore and commentary out there, you'd best start making your archived backups now. I myself occasionally dabbled in the LISTSERVs in the early 2000's but I never got into them enough that I'd have an attachment to the content in these archives. Part of me would like to sift through them for some interesting content to highlight on Greyhawkery but perhaps like Wizards, it's best to let this one go. Welcome back Greyhawk fans! Let's get back to the third chapter of our ongoing Castle Greyhawk graphic novel. Check out page-ten and read some illuminating exposition by staff writer Scott Casper. On our site you can also check the archives and follow the entire Castle Greyhawk story from the very beginning. Artist's Commentary: The eiger battle comes to a close and now we get a moment of levity as the magic-users critique the main spell of the encounter. Sharing spells is kind of a tradition of D&D as they are hard to come by. It may also be why all these "named" NPC wizards have their own personally created spells. Will we ever get to see any? Only our narrator knows for sure! "Today, Wizards of the Coast announced the latest Dungeons & Dragons storyline, Elemental Evil, which includes new product offerings for both digital and tabletop RPG players. The Elemental Evil storyline will begin this March and run through mid-summer allowing players to explore the Forgotten Realms and defeat the secret cults that threaten to wipe out the Sword Coast. 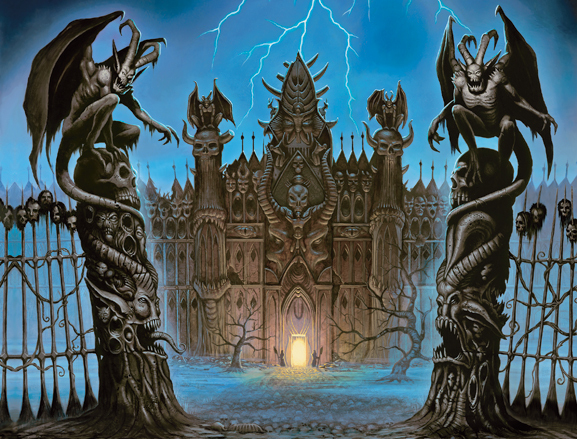 · Temple of Elemental Evil adventure system board game and pre-painted collectible miniatures that support the Elemental Evil storyline from WizKids Games"
A boardgame featuring the temple sounds intriguing in the very least, although the pessimist Greyhawk fan in me wonders if it'll be the Temple in title only. The trick to this release is the main storyline is nominally set in the Forgotten Realms, (which I have no problem with) so wouldn't it seem confusing to newer players if the elemental-themed boardgame referenced a different setting? 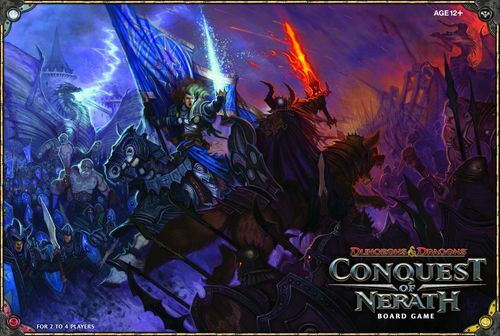 Furthermore, a generic Temple of Elemental Evil has already been referenced once in 4th Edition's Conquest of Nerath boardgame. I hope this time it won't be the case. Fingers crossed this spring. "Hidden in the dungeon of White Plume Mountain, Blackrazor shines like a piece of night sky filled with stars. Its black scabbard is decorated with pieces of obsidian." "The trident has a nostalgic attachment to the place where it was forged, a desolate island called Thunderforge. A sea god imprisoned a family of storm giants there, and the giants forged Wave in an act of devotion to - or rebellion against- that god." The hammer also carries a secret shame. Centuries ago, a dwarf named Ctenmiir wielded it valiantly for time. But Ctenmiir was turned into a vampire." Even though the lore given for these sentient items come from previously published material (Revised White Plume Mountain namely) they seem fresh presented here in a core book for general use. Hopefully these entries will entice some people to try them out in the new rule-set or in the very least try out White Plume Mountain again. More DMG exploration next time. 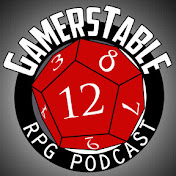 Welcome back, it's a new year Greyhawk fans! Let's get back to promoting the third chapter of our ongoing Castle Greyhawk graphic novel. Check out page nine and read some literary devices by fantasy elocutionist Scott Casper. On our site you can also check the archives and follow the entire Castle Greyhawk story from the very beginning. Artist's Commentary: The battle with the eiger clan begins to wind down as the adventurers (I decline to call them heroes as Mordnenkainen is as amoral as they come) use a balanced attack of might and magic. The eigers' superior size and strength are no match for a roiling cloud of death combined with sniping arrows. Robilar and Terik of course take some licks in the final rounds of combat. This page was quite fun to draw. The action scenes and the ogres have been a pleasure to render. What is exciting is this is still early on in chapter three! Enjoy. Frequent reader of the blog and avid Greyhawk mapping enthusiast Christopher Letzelter has created a stunningly good poster-sized city map available at RPNow titled Chernel. The map of Chernel is loosely based upon the planned city of Chendl the capital of Furyondy first developed in Fate of Istus and partly ruined in From the Ashes. Chernel goes beyond its source material and is a homebrew work in its own right, a layered PDF map with nearly 400 unique features, though still easily adaptable for any Greyhawk campaign. If you want a highly detailed map to base an urban campaign around (other than The City of Greyhawk for once) then perhaps Chernel can get you started! Over at ENWorld they are previewing the covers for 2015's next big D&D story arc concerning Elemental Evil. The two products listed are an Adventurer's Handbook and Princes of the Apocalypse. The comments section of this news item yields some interesting reactions; in particular to the story being set in the Forgotten Realms and involving the Elder Elemental Eye (originally of Greyhawk). That certainly sums up my initial thoughts too. It's almost as if those in charge (who are largely fans of Greyhawk) want to do Greyhawk storylines but can't bring themselves to stop making Forgotten Realms because it sells no matter what. "Yeah, had these not been set in the Realms, they would have been an almost sure-fire sell to me. In the Realms? No interest. In defense of this storyline I don't think the product blurb linked above mentions the Temple of Elemental Evil. Stripping that out of Hawk for Faerun would indeed be Grade A heresy sure, but to say Greyhawk has some sort of claim over elemental bad guys and cults is sketchy at best. Anything elemental related, including the Elder Elemental Eye is multiversal in scale at this point. "I have to agree with this sentiment. They've said they'll do other settings IF they have a story, and then they pull stories from other settings to force them into the Realms. Now this point does kind of worry me. If a trend does in fact develop where Greyhawk or any other setting's best material is co-opted to use in the default Realms I would start rail against it too. It's still too early to say. And yes he is right, FR fans should be worried too. I'm not well versed in the setting, but what happened to the Sundering? Is the Realms "fixed"? Are these storylines a sign it is played out? It never occurred to me that Dragonlance may have the strongest claim on Tiamat, but yeah I see his point and about the more Realmsy villains. Debatable but it's a nice diplomatic response to the over-reactions. If both settings are lagging from age, perhaps a novel approach could be to be put Greyhawk in production alongside Forgotten Realms so Wizards could GASP do epic cross-over storylines across both worlds. Anything goes and no arguments about which setting owns what. Yup, that's what Planescape and Spelljammer were made for, let's cross over those worlds like in the old days! Oh well enough of this for now. More next time.